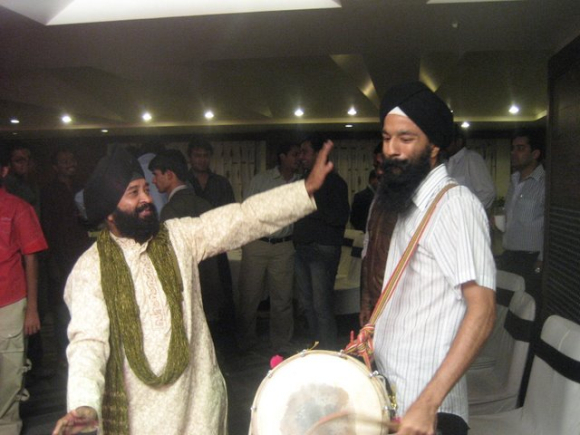 The venues and festivals Sikh activist, children's educator, musician and essayist Sonny Singh has performed at include New York's Lincoln Center, the Chicago World Music Festival, the Chicago Folk and Roots Festival, the Montreal Jazz Festival, the New Orleans Jazz and Heritage Festival, the Molde Jazz Festival (Norway), and the Pori Jazz Festival (Finland). Currently, he is a member of the 'bhangra-funk' band Red Baraat - Sunny Jain is a co-founder- and has been touring the United States and the world. Singh is also a member of the Left Turn Magazine collective and writes on social justice issues for small but focused publications including The Langar Hall, Sikh Chic and the Asian American Literary Review. 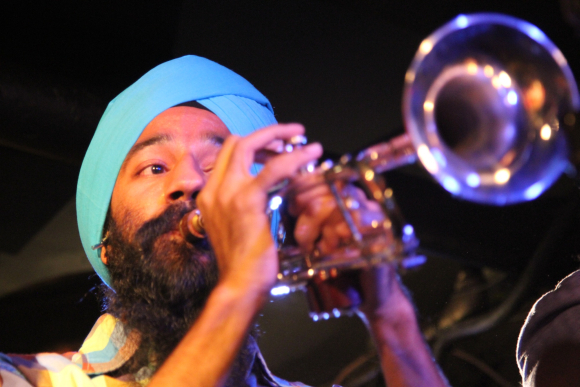 Image: Sonny Singh at Nublu, New York City. Last year, The New Yorker ran a half-page photograph of his band on its page of significant events in the city. Tell us about your family and your early years. My parents are from Pune, and came here (the US) in the 1970s. Growing up as a Sikh in North Carolina and Arizona, I always faced a lot of harassment and racism. Being teased and bullied in school was a daily occurrence for me. I was a very shy kid and didn't really talk to anyone about what I was going through, not even my parents or my brother. 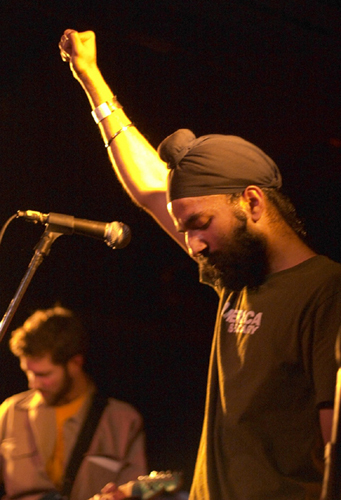 Image: Singh at globalFEST at Webster Hall in New York City. I finally had some outlets to engage in dialogue about these issues and the struggles of others after my junior year in high school, and this shifted things for me in many ways. It was very empowering to share my story and connect it to the stories of my peers, and ultimately realize that what I was experiencing was much larger than me. That racism and other forms of oppression have existed for centuries, as have social movements to fight for liberation. As a child, I was singing and playing harmonium in gurdwaras in North Carolina. 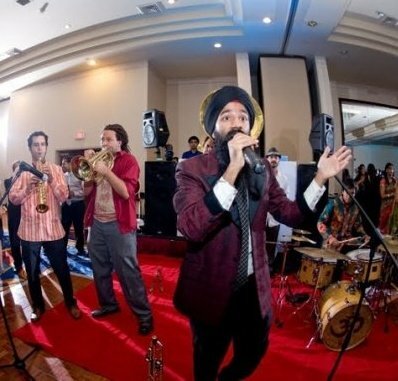 I began playing the trumpet at age nine and have since played in a variety of types of bands including rock, ska/reggae, South Asian fusion, funk, bhangra, and hip hop. Image: Singh performs at Festival d ete de Quebec, Canada. 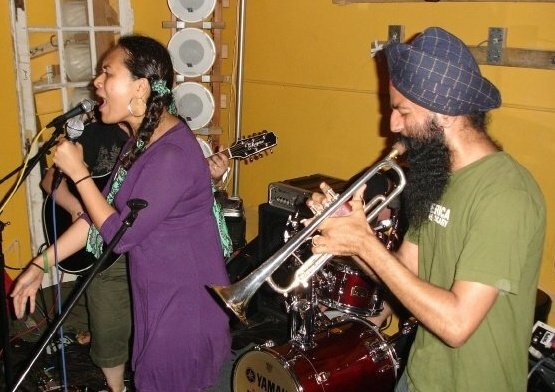 In Tucson, I co-founded and fronted the popular local ska band Turban Jones from 1997-2001... Two years later, I co-founded a genre-bending political rock band Outernational in NYC, and sang, played trumpet, the dhol, and harmonium in the group until April 2008. 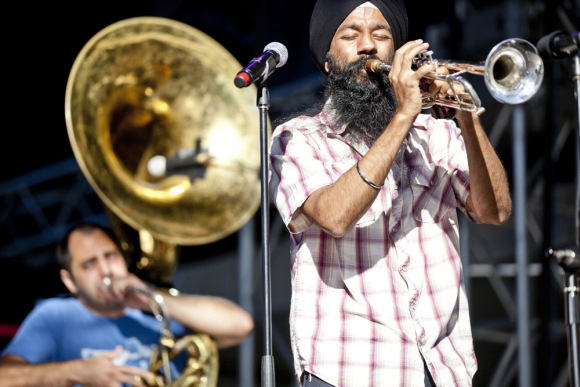 Red Baraat is a nine-piece bhangra funk band, the first and only dhol n' brass band in the US. 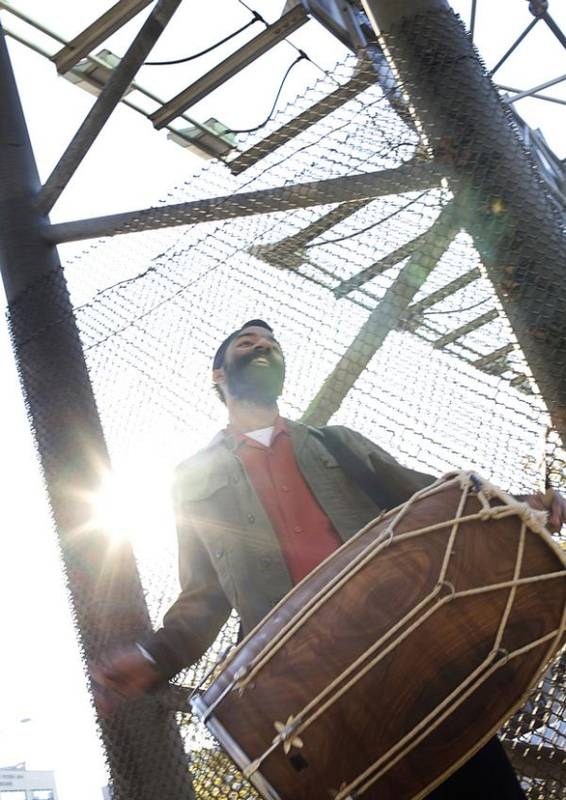 I play the dhol at weddings, baraats, parties, fundraisers, and rallies/protests, and I continue working with a number of artists in genres as diverse as rock, folk, hip hop, punk, and Indian fusion. How did your activism start? My initial activism was mostly focused on facilitating anti-racism and anti-oppression workshops for young people. Image: Singh performs in Brooklyn in New York. This work has continued until today, and is a huge part of what I do. I started an organization in college at the University of Arizona called Beyond Tolerance, which conducted workshops in dorms and other events around campus to engage students in dialogue about racism and other forms of oppression. I was studying sociology and Latin American Studies in college. Learning about theories of social change, the history of US interventions in Latin America, and social movements informed my own political development. I soon became involved in the labour movement and anti-sweatshop movements. I also have an MEd in social justice education from the University of Massachusetts, Amherst. 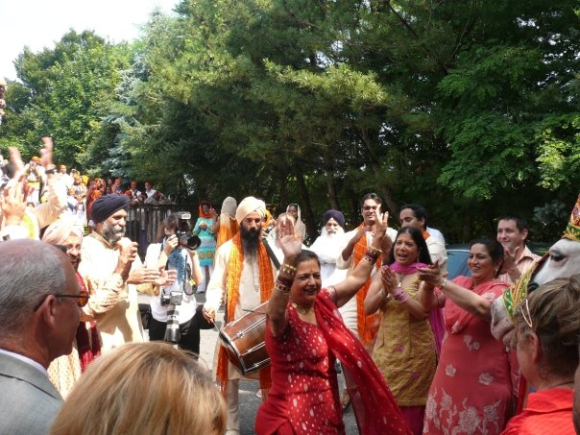 Image: Singh at a wedding in Long Island, New York. How did your parents react to your activism? My activism became more at odds with my dad in particular, since he worked in management of a company and wasn't a fan of unions. He is a mechanical engineer who works in management for a company that makes lawn and garden equipment. My mom does volunteer work mostly, but has previously worked in accounting and customer service. We struggled a lot dealing with my activism, and he wanted me to pursue engineering or get an MBA or something along those lines - he had one doctor son, my older brother, already. 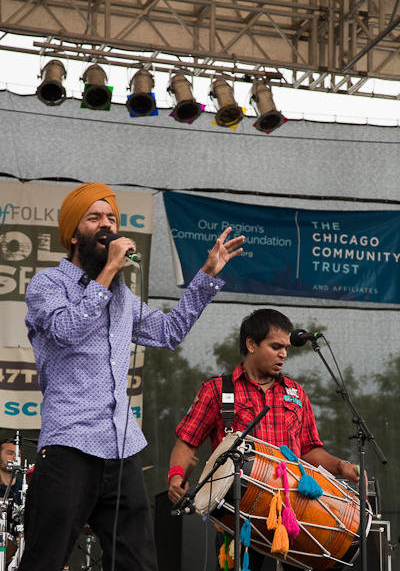 Image: Singh performs at Chicago Folk and Roots Festival. And it took a while for him to accept that my career path was going to look very different from those of most of my desi peers at the time. It's taken time for my parents, my dad in particular, to fully support my life's work -which is to fight for social and economic justice and express myself creatively through music. But at this point, they are generally supportive. I can have meaningful conversations with them about the activist work I am doing, including Occupy Wall Street. Their only concern is that I don't get arrested. While we may not always agree on everything, we can have the conversations. And they love my band Red Baraat and are supportive of my path as a professional musician now as well, though they always worry if I am making enough money. It's understandable, since I often worry about this too! Image: Singh at Joe's Pub in New York City. How did your activism in New York start? Living in New York since 2003, I have worked as research analysis and campaigner, Unite Here (labour union) and as a community organizer for Champ, or the Community HIV/Aids Mobilization Project, and for the Sikh Coalition. I am a part-time humane education instructor for the organization called Heart, which teaches children an ethical way of life that includes animal welfare. What have you been doing at the 'occupied' zone? My time at Liberty Square is sometimes spent attending the nightly general assemblies where decisions are made by consensus, sometimes participating in marches, sometimes playing a musical instrument. 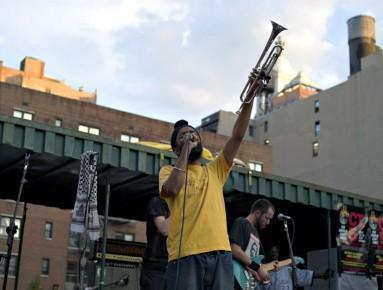 Image: Singh at Union Square in New York City. It is not always possible for me to carry the dhol but I carry the trumpet. Recently I spent about three hours playing the dhol along with two other drummers of colour, one with a Brazilian samba whistle, and towards the end, a group of others playing Afro-Cuban rhythms on congas and cowbells. The crowd's energy and the rhythmic solidarity I felt with my co-drummers kept me going long after my shoulders were aching and my wrists were stiff. As we rolled up to Liberty Square in a deep bhangra groove with friends and strangers dancing in resistance to corporate greed all around us, I felt the lights of news cameras and felt that very moment we were also a face of the movement. Image: At a wedding sangeet in Pune, India. You have written about Sikhs and the protest. I haven't yet seen one other person who was easily identifiable as a Sikh. I'm sure other Sikhs have come through at different times, but to be sure, this is no significant Sikh presence. Where there is a significant Sikh presence, however, is on Wall Street itself. Banking appears to be a go-to career for a lot of young and intelligent Sikh Americans who come from privileged backgrounds. Almost every time I'm in lower Manhattan I see Sikhs in their nice suits in the Wall Street area. I am not disrespecting any Sikhs who choose to work in investment banks or assume their reasons for working there. Image: With Mahina Movement, NYC. But I do want to assert that how we make a living is a deep ethical and spiritual question. 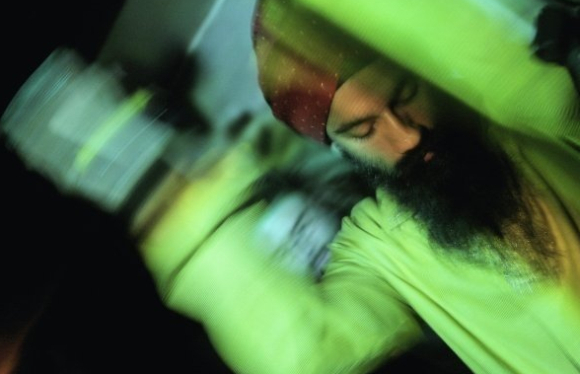 I ask: Is how I make a living in line with Sikhi and in line our Gurus' vision of the world? By extension, I can ask the question to people of other religions, too. I wonder if making money with no regards whatsoever for the well-being of the majority of people in our society seem in line with Sikh principles of equality and justice. Our Gurus consistently identified with the 'lowest of the low' and the poor, and spoke up for those at the bottom of society. Image: Singh at an engagement party in Long Island in New York. The Gurbani says: Nanak seeks the company of the lowest of the low class, the very lowest of the low. Why should he try to compete with the great? For, where the weak are cared for, Thy Mercy is showered. The scholar Jagjit Singh reminds us that the Gurus wanted to bring about revolutionary changes. It was from this purpose that Guru Gobind Singh created the Khalsa in order to capture political power for a plebian mission... 'Cherishing the poor' and 'destroying the tyrant' are, according to Sikhism, God's own mission. I have wondered for a long time and especially in recent weeks: Why should we treat the corporate tyrant any different from the tyranny of Aurangzeb against which Guru Gobind Singh led a fierce fight? Image: At Southpaw, Brooklyn, New York. Check out these fabulous floating homes!